Manufacturer of a wide range of products which include compressor operated suction machine. We are counted as consistent firm actively involved in developing best in class Compressor Operated Suction Machine. The suction machine is developed with oil immersed piston pump and gaining huge acclamation for its maintenance-free performance. Engineered to provide powerful suction the offered machine features vacuum capacity of 700 mm/Hg. 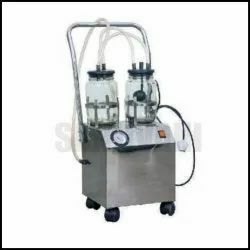 Designed with two fluid containers the high-quality machine is accessible at a leading price.